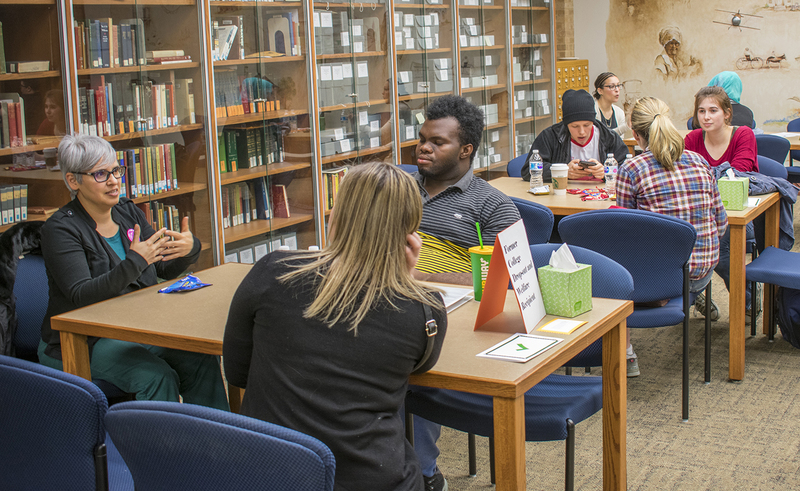 NE students, faculty and staff presented themselves as “open books’’ for people to gain insight and understanding during an unconventional learning experience called “The Human Library” on April 5. Students visited with people serving as “books” to learn their stories and ask questions. The Human Library, or “Menneskebiblioteket” as it is called in Danish, was designed to build a positive framework for conversations that can challenge stereotypes and prejudices through dialogue. It was developed in Copenhagen in 2000 as a project for the Roskilde Festival by Ronni Abergel and his brother Dani to stop violence, according to the humanlibrary.org website. The event started on NW last April, and NE assistant director of library services April Martinez and NW administrative assistant Melanie Hecko organized the event. 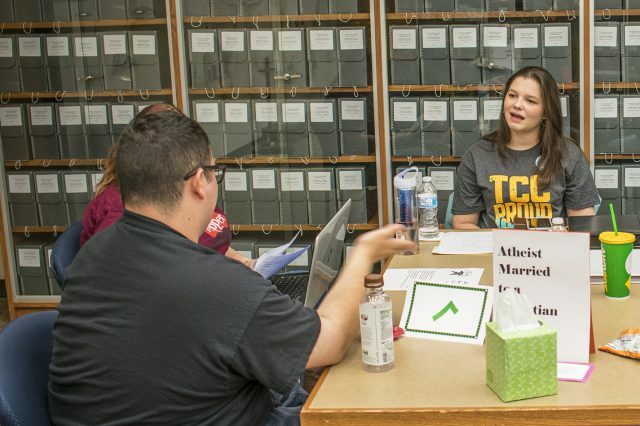 “We wanted to get the conversation started because there is so much diversity at TCC with students and faculty, and have an open dialogue,” Hecko said. NE student Courtney Carter, part of The Human Library on NE, speaks with visitors about her experiences April 5. NE financial aid associate Andrew Rodriguez role-played as a book for the first time at this year’s event. Rodriguez said for him, the event was to build connections because people are multi-layered and need to get to know one another to start conversations and stop stereotypes. “My story is based on my growing up in El Paso with me being queer, identifying as Chicanx, about me coming to terms with my identity and how I grew into it moving from there to the Metroplex,” he said. NE student Destiny Williams, who also portrayed a book, said she didn’t know what to expect when she offered to share her story. Williams said she thought the event would be awkward because she expected to have to answer difficult questions about her personal life. But in the end, she said she enjoyed the event. “It became a comfortable place where you could either listen or input your opinion if you wanted to, and that’s what I absolutely loved about it,” Williams said. Martinez said she noticed the event became a place for people who might be going through some of the same things the storytellers went through and could serve as a place to find help and additional resources. Hecko said it’s encouraging to see people who struggled with their life or identity and then were able to overcome their obstacles. The Human Library event gives students faith and motivation, she said. 10 a.m.- 2 p.m. April 19 at the Walsh Library. Contact NW administration assistant Melanie Hecko at 817-515-7728.